The beautiful county of Ceredigion is bordered by the Irish Sea to the west and sheltered to the east by the Cambrian Mountains. The spectacular landscape is characterised by our river valleys, each with its own character. Bwlch Nant yr Arian lies at the head of a dramatic dead-end valley and is our most popular woodland in Ceredigion with its visitor centre, panoramic views and daily red kite feeding. Not far from Devil’s Bridge the car park at the Arch is the starting point for a number of attractive walks offering some of the best panoramic views in mid Wales. Near Pontrhydygroes in the Ystwyth valley, you can find numerous dramatic walks in the 18th century Hafod estate of Thomas Johnes. 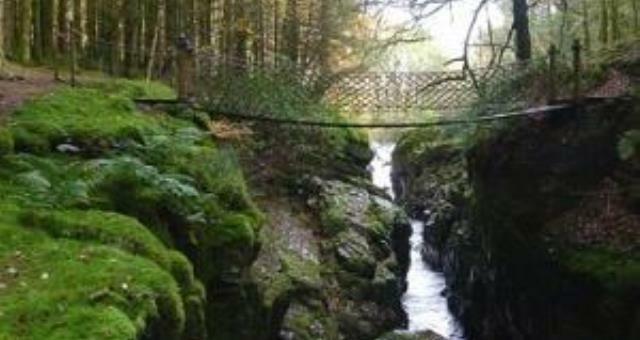 Further along the Ystwyth valley you will find Coed Maenarthur which offers views, gorges, waterfalls and one of Wales’s most impressive hillforts. Carry on down the valley and you will come to the Grogwynion car park where there is a choice of attractive woodland walks. 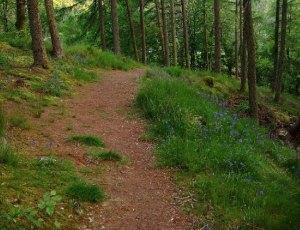 Further towards the coast Black Covert offers a lovely level riverside walk or try the climb up through Birch Grove (park at Black Covert) to the Allt-fedw hillfort. Close to Aberystwyth are the Gogerddan woodland walks. These are very pleasant walks with wonderful views and fantastic veteran trees. Ystwyth Forest is nine miles east of Aberystwyth. Take the A44 from Aberystwyth to Llangurig. After approximately five kilometres take the left hand turning at Lovesgrove onto the A4159 for Machynlleth. After going through Capel Dewi you will climb a hill. When descending look for a crossroads at the bottom and turn right for Penrhyncoch. Go past huge greenhouses on your right and pass a row of houses on the left. The car park entrance appears suddenly on the left after the last house. The OS grid reference is SN 718 813. Take the B4574 from Devil's Bridge to Cwmystwyth. Approximately three kilometres from Devil's Bridge, you pass a stone arch on the left and the car park and picnic area is just after it. The OS grid reference is SN 765 756. Take the B4340 from Aberystwyth to Trawsgoed. Follow this road through Trawsgoed until the road crosses the River Ystwyth and then turn immediately left, following the river. The car park and picnic site is on the left a few hundred metres after the saw mill. The OS grid reference is SN 694 715. Take the B4340 from Aberystwyth to Trawsgoed. Turn right over the bridge (signed Llanilar B4575) then turn immediately left and left again into the car park. The OS grid reference is SN 667 730. Take the B4340 from Aberystwyth to Trawsgoed. Follow this road through Trawsgoed until the road crosses the River Ystwyth and then turn immediately left, following the river towards Pontrhydygroes. At the entrance to Pontrhydygroes village, park sensitively on the left-hand side of the road by the Miners’ Bridge (opposite the mill wheel). Go through the footpath gate to get to the walk. Parking is free of charge at these car parks. The nearest train station is in Aberystwyth. Buses pass near the car parks at Gogerddan and Black Covert. Please note: Sometimes we need to close or divert trails for your safety whilst we undertake maintenance work or forest operations. Occasionally we may have to close a site in extreme weather, such as high winds or snow and ice due to the risk of injury to visitors or staff. Please always follow any instructions onsite and make sure you follow any temporary diversion signs in place. See below for directions to these car parks and for parking advice in the village of Pontrhydygroes (which is the starting point for the Maenarthur Trail). The OS grid reference is SN 738 722. The nearest railway station is in Aberystwyth.